Researchers are increasingly keen to construct bulk nanocomposite materials from biosourced and renewable nanoscale building blocks. Cellulose, as a crystalline cellulosic polymer, is the most copious biosourced and renewable polymeric material on earth, which can be extracted from plant or formed by bacteria. Bacterial cellulose (BC) nanofibrils have a high tensile strength as high as Kevlar and steel and spontaneously developed a strong three-dimensional (3D) nanofibrous system, which makes it a suitable platform for the creation of functional bulk nanocomposites. BC and its nanocomposites have been extensively used in numerous fields, including electron device, acoustic membrane, catalyst, and energy storage. 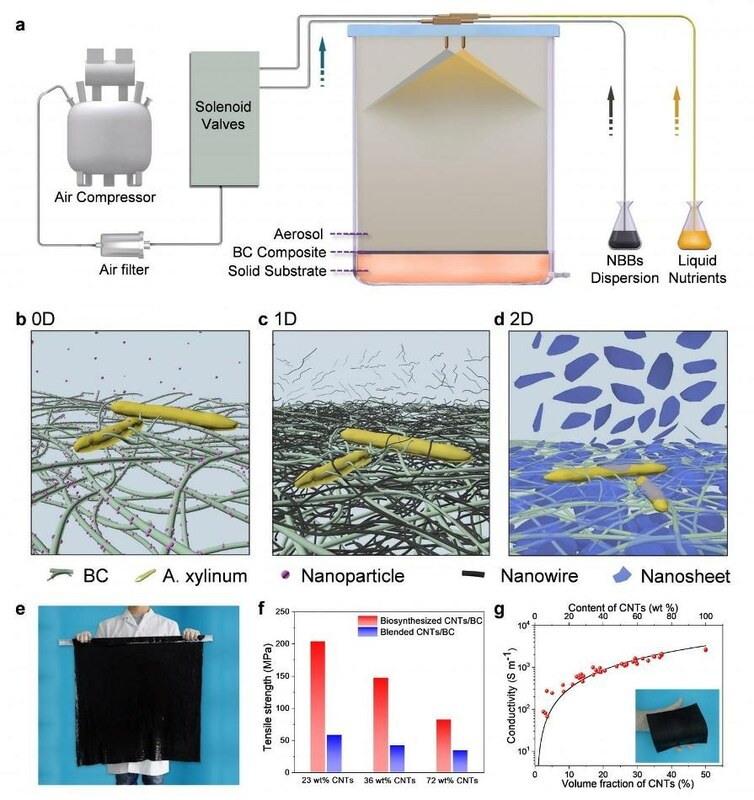 However, the traditional process for fabricating uniform BC nanocomposites required the disintegration of a 3D network structure for solution processing, which critically impaired the mechanical performance of the nanocomposites. Therefore, strategies without disintegration of the 3D network structure are crucially important for building bulk BC-based nanocomposites. In reaction to this challenge, scientists led by Professor Shu-Hong Yu from the University of Science and Technology of China (USTC) effectively formulated a common and scalable biosynthesis strategy, which involves instantaneous growth of cellulose nanofibrils by means of microbial fermentation and co-deposition of different types of nanoscale building blocks (NBBs) through aerosol feeding on solid culture substrates. This technique overcomes the diffusion restriction of nanoscale units from the liquid medium to the upper surface layer of newly-grown BC, through which, scientists successfully made a series of bulk nanocomposites of BC and nanoscale building blocks of various shapes, dimension, and sizes. Mainly, the technique can be easily expanded for potential industrial applications by employing large reactors and adding more nozzles. To showcase the importance and uniqueness of this technique, scientists adjusted the content of CNTs in a broad range from 1.5 wt% to 75 wt% by altering the concentration of CNTs suspensions. Keep in mind that conventional fabrication technique for CNTs nanocomposites which requires the blending of CNTs dispersions with polymer solutions is only relevant for the preparation of polymer nanocomposites with low CNTs (< 10 wt%), as it is very tough to homogeneously disperse high-concentration CNTs in polymeric hosts. To additionally show the benefits of the biosynthesis strategy for preparing mechanically reinforced nanocomposites, CNTs/BC nanocomposite films were also prepared for comparison by mixing of CNTs and disintegrated BC suspensions. Both Young’s modulus and tensile strength of the biosynthesized CNTs/BC nanocomposites were extraordinarily higher than that blended samples. Consequently, the biosynthesized CNTs/BC nanocomposites realize concurrently a very high mechanical strength and electrical conductivity, which is of crucial significance for practical application. This universal and scalable biosynthesis strategy makes it viable for concurrent growth of cellulose nanofibrils by means of microbial fermentation and co-deposition of different kinds of nanoscale building blocks via aerosol feeding on solid culture substrates. “By upgrading the state-of-the-art production line that produces pure bacterial cellulose pellicles, industrial-scale production of these bulk nanocomposite materials for practical applications can be expected in the near future,” the scientists forecast.